Godwin Pumps recently completed a drinking water influent bypass. A canal, which provides water to an Indianapolis, Indiana drinking water treatment plant, was suffering from years of sediment and mud build up which restricted the water inflow to the plant. To clean out the sediment and mud from a 2,000 foot section, the canal was bypassed with 10 DPC300 and two CD400M electric drive Dri-Prime pumps discharging into seven lines of 18-inch HDPE pipe, each stretching 2,300 feet. 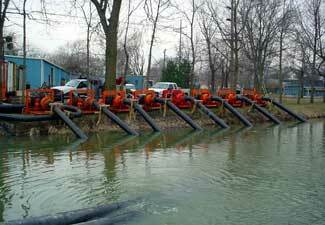 The 60 MGD bypass allowed Bowen Engineering of Indianapolis to install a dam, dewater the flume, and extract all flow restricting sediment and mud. To minimize sound levels and eliminate the risk of diesel fuel spills, electric drive Dri-Prime pumps were specified for the application. Variable Frequency Drive (VFD) controllers were used on the CD400M pumps to regulate engine speeds to meet the treatment plant's varying inflow requirements. Dual 18-inch HDPE siphons discharging into a nearby spill way were draped over the dam for flood control. Two Godwin fusion technicians worked directly with labor and equipment operators supplied by Bowen Engineering to complete the job in three weeks. The pumps ran non-stop for two months; the job ended in late March 2005.